The Australian comedy Summer Heights High (by Chris Lilley) ran an online campaign to promote the DVD release of the series. The promotion encouraged the marking of a Sorry Ranga Day, earmarked for August 10th 2008. 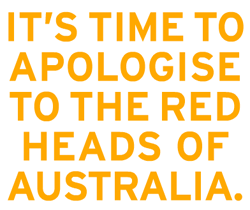 It's time that the Australian population apologised for the indignity and degradation inflicted on red headed people and moved to a future based on mutual respect, mutual resolve and mutual responsibility. The Ginger Generation, Blood-Nut, Ginger Megs, Bluey, Carrot Top, Ginga, Freckly Arms...and Ranga. The hatred has to stop! Red-haired people across Australia have been unfavourably compared to orang-utans since Summer Heights High first aired across Australian television screens in 2007. 'Ranga' is now firmly entrenched in the vocabulary of ordinary people all over this country. So join the Australian nation on Sunday August 10th 2008, and let a Ranga know that you are sorry. The comedy was one of my favourites when it was shown on BBC iPlayer earlier this year. You can grab the DVD at Play.com (UK), Amazon.co.uk (UK) and Amazon.com (US). He never said he invented it, just that since the show made it widely known across the country, it's partially their fault. All he's implying (correctly, might i add) is that because of Summer Heights High, there's a widespread recognition of the word 'ranga'.